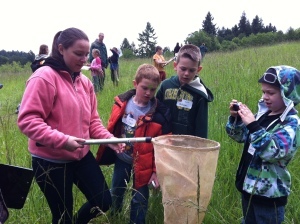 The McMinnville Education Foundation is excited to be partnering with the McMinnville School District 40 to offer hands-on science experiences outside the classroom to every elementary student in kindergarten through 5th grade. The program is aligned with the state science standards established by the Oregon Department of Education. Kindergarteners visit Miller Woods to participate in activities that involve them in observing and interacting with the habitats there. This includes catching insects in the meadow, experiencing the forest though a hike, examining pond critters, sketching the pond habitat, and leaf rubbing. 1st graders visit the Evergreen Space Museum to engage in hands-on experiments to encourage creative and innovative thinking. The experiments include concepts of sound energy, light energy, and using energy to communicate. 2nd graders expand their understanding of living habitats though comparing what lives in the forest, grassland, and water habitats of Miller Woods. Students also build birdhouses to take home or to donate to identified areas of their community. 3rd graders also get an extended study of their robotics unit at the Evergreen Space Museum. The students spend several weeks learning how to design and program Lego robots culminating in a robotics challenge and competition. 4th graders visit Metsker Park to make observation, take measurements, and engage in hands-on activities to develop a deeper understanding of how earth’s physical features undergo changes due to factors such as erosion and weathering. 5th graders visit the Haskins Creek Water Treatment Plant where they engage in four activities: a hike to the water shed, learning about water filtration, building a water shed, and a “How Wet is Our Planet” activity. McMinnville High School students support the K-5 students and their teachers with their science activities in the following ways. Early Childhood Education Pathway students help with the K trip to Miller Woods. Education Interns help with the 2nd grade trip to Miller Woods and the 5th grade trip to the water treatment plant. EASA students help with both 3rd grade trips to Evergreen.